I wanted to point out a little milestone! 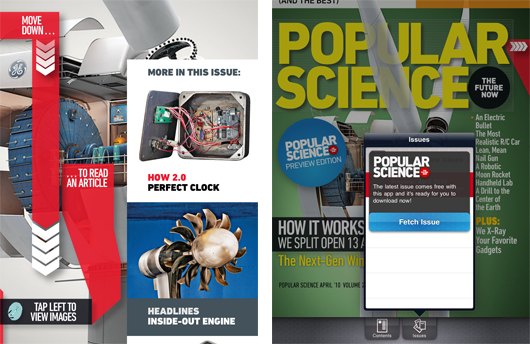 You may remember we built Popular Science+ for the iPad — available on the day the iPad was launched (3 April), it was the first magazine available, and based on our Mag+ concept from December 2009 with Bonnier. Over the summer, we took this system from prototype to hand-over: for the past months, Bonnier have developed the platform, deepened the integration, and are now rapidly adding features and titles. …now there are five magazines on the Mag+ platform! In three languages. All launched on the App Store, all published every month. Read more about the platform and see the magazines at magplus.com. And have a look at PopSci’s write-up of the four new mags. They’re really worth a look. The various art directors are really beginning to understand the visual design possibilities of Mag+, the layouts are moving way beyond the simple right-column, left-photo place we started. It’s exciting to see, and exciting to imagine what comes next. I’m really pleased to see Bonnier developing the platform so well, and to see the seeds we planted together blossom so beautifully. My piece on iPad magazines for Icon’s September 2010 issue. Outgoing editor Justin McGuirk asked me to write a little about the near-future of digital magazines for Icon #87, in which I talk a bit about challenges of the context they now find themselves in as a media form, as well as things we think we learned during the Mag+ project. They’ve kindly allowed us to republish it here. Big names such as Wired, Vanity Fair, Time and Popular Science (which our studio, BERG, helped to bring to the iPad with the Mag+ platform) have released editions into the App Store and made proclamations that it’s the future of magazines. However, the very term “digital magazine” smacks of “horseless carriage”, Marshall McLuhan’s term for an in-between technology that is quickly obsolete. While nothing is certain about the future of any media, there is no doubt that the digital tablet form will grow in popularity, with the iPad being joined later this year by numerous other (possibly cheaper) competitors mainly powered by Google’s Android operating system. 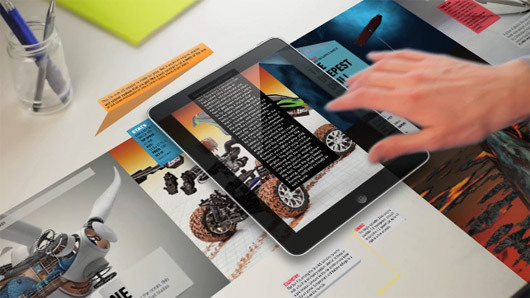 So, what does the future really hold for digital magazines? We can identify some challenges and some opportunities. One certainty is that the manner by which we discover and purchase magazines will be given a hefty thump by the switch to digital. We are in a world of search rather than browse – which perhaps in turn leads to a change in the role of cover design, from “buy me, look what’s inside” to “you know what’s inside, but here is an incredible, evocative image”. In many ways it’s a return to the “classic” magazine covers of the 1950s and 60s, privileging the desirability of the object itself rather than shouting about every feature. The bounded “object-ness” of the magazine embedded in the world of the endless, restless internet is seen by most as an anachronism, but it is also one of its greatest attributes. Research we received from our client Bonnier as part of the brief for the Mag+ concept indicated that people really were attached to the magazine as a form of media that creates a bubble of time to indulge in reading – and as a contrast to other, faster forms of media. Meeting this need – while acknowledging the breadth, speed and interconnectedness of the internet – is a design condition that has not been satisfied fully by the current crop of digital magazine offerings, our efforts included. But stay tuned. Another change in what we might term the “attention economics” of digital magazines is that their new neighbours in the app ecosystem are not other magazines, but games, spreadsheets, supermarket delivery apps, photography apps and so on. One device is now the conduit for vastly different activities and experiences. And yet – at least in the current user-interface paradigm of Apple and Google – they all get pretty much the same real estate on screen. You have to decide between killing time with a magazine, playing Angry Birds or ordering your Ocado delivery based on the same visual evidence. Perhaps future iterations of mobile and tablet operating systems will have a more media-led approach, as evidenced by the new Windows Phone 7 mobile operating system (yes, that’s right, Microsoft has made a more media-centric user interface than Apple) – leading to magazine icons being bigger or more varied on the media surface. Still, having such vastly different neighbours nestling so close creates a new context for an old form that has heavier production costs than its new competitors. A casual game developed by five people commands the same attention of a magazine produced by 25. That is remarkably imbalanced, but don’t think these attention economics will stand. The production and form of the magazine cannot fail to be affected. Internet-native publishers such as gadget expert Gizmodo, fashion maven The Sartorialist or critically minded gamer Rock, Paper, Shotgun are smaller and nimbler. And eventually they’ll be able to publish to the same canvas as the big boys and girls – and be able to charge for their expert curation and commentary. Which brings us to some of what I’ve started to call “two-star problems”. In the consumocracy of the App Store, star ratings are all, and unfortunately most of the current magazine offerings have only two stars, compared to the four- or five-star world of games and other apps. Even Wired and, I’m sad to say, Popular Science garner a “must-try-harder” three stars. Consumer dismay at customer service, reliability, consistency, pricing and the overall offer seem to lead to these relatively low ratings. Consumers’ expectations are determined by the value they see offered by software producers compared to traditional media producers. So where to head? What are the opportunities? I think they are supplementary to what magazine publishers see as their existing strengths in writing, curation and design. They will emerge from their less glamorous but equally deep knowledge of subscriptions, service and “belonging”. Take the best of what you understand of your readership and the decade or so that many magazines have spent on the internet and look to exploit the social technologies of the web, rather than run to present your content as an isolated recapitulation of a mid-1990s CD-ROM. Create hybrids and experiment – not with the empty (and costly) spectacle of embedding jarring 3D and video, but with data, visualisation, sociality, location-based services, semantic technologies. There’s no reason that the feel of a well-designed, valuable, curated object shouldn’t be complemented when placed properly in the roaring, sparkling stream of the internet. And experiment not just with editorial content, but also with advertising. I’d rather have a live link to the latest Amazon price for a camera than a spinning 3D video of it. Tablets promise to be transformative – in their context of use and how well they can display content – but they do not wish away the disruptive challenge (and opportunity) the internet presents to magazine publishers. This is the beginning of a tumultuously exciting time for magazines and those who produce them – not an end to the “free-for-all” of the web as many would love to believe. More experimentation, not less, is what’s called for. As a reader and a designer, I’m looking forward to that. 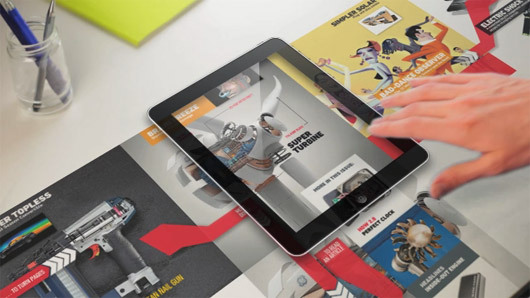 In December, we showed Mag+, a digital magazine concept produced with our friends at Bonnier. Late January, Apple announced the iPad. 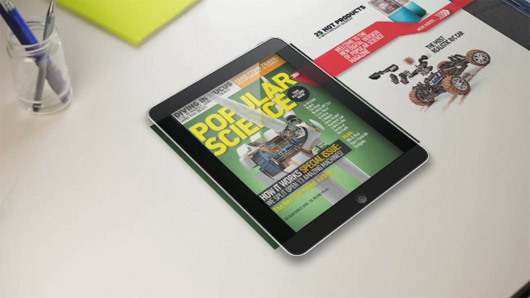 So today Popular Science, published by Bonnier and the largest science+tech magazine in the world, is launching Popular Science+ — the first magazine on the Mag+ platform, and you can get it on the iPad tomorrow. It’s the April 2010 issue, it’s $4.99, and you buy more issues from inside the magazine itself. See Popular Science+ in the iTunes Store now. Here’s Jack, speaking about the app, its background, and what we learned about art direction for magazines using Mag+. Articles are arranged side by side. You swipe left and right to go between them. For big pictures, it’s fun to hold your finger between two pages, holding and moving to pan around. You swipe down to read. Tap left to see the pictures, tap right to read again. These two modes of the reading experience are about browsing and drinking in the magazine, versus close reading. Pull the drawer up with two fingers to see the table of contents and your other issues. Swipe right and left with two fingers to zip across pages to the next section. Dog-ear a page by turning down the top-right corner. There’s a store in the magazine. When a new issue comes out, you purchase it right there. Working with the Popular Science team and their editorial has been wonderful, and we’ve been working together to re-imagine the form of magazines. Art direction for print is so much about composition. There are a 1,000 tiny tweaks to tune a page to get it to really sing. But what does layout mean when readers can make the text disappear, when the images move across one another, and the page itself changes shape as the iPad rotates? We discovered safe areas. We found little games to play with the reader, having them assemble infographics in the act of scrolling, and making pages that span multiple panes, only revealing themselves when the reader does a double-finger swipe to zoom across them. It helps that Popular Science has great photography, a real variety of content, and an engaged and open team. What amazes me is that you don’t feel like you’re using a website, or even that you’re using an e-reader on a new tablet device — which, technically, is what it is. It feels like you’re reading a magazine. Apple made the first media device you can curl up with, and I think we’ve done it, and Popular Science, justice. The story, for me, is that the design work behind the Mag+ concept video was strong enough to spin up a team to produce Popular Science+ in only two months. Not only that, but an authoring system that understands workflow. And InDesign integration so art directors are in control, not technologists. And an e-commerce back-end capable of handling business models suitable for magazines. And a new file format, “MIB,” that strikes the balance between simple enough for anyone to implement, and expressive enough to let the typography, pictures, and layout shine. And it’s set up to do it all again in 30 days. And more. It’s all basic, sure. But it’ll grow. We’ve built in ways for it to grow. But we’ve always said that good design is rooted not just in doing good by the material, but by understanding the opportunities in the networks of organisations and people too. A digital magazine is great, immersive content on the screen. But behind those pixels are creative processes and commercial systems that also have to come together. Inventing something, be it a toy or new media, always means assembling networks such as these. And design is our approach on how to do it. I’m pleased we were able to work with Popular Science and Bonnier, to get to a chance to do this, and to bring something new into the world. Thank you to the BERG team for sterling work on El Morro these last two months, especially the core team who have sunk so much into this: Campbell Orme, James Darling, Lei Bramley, Nick Ludlam and Timo Arnall. Also Jack Schulze, Matt Jones, Phil Gyford, Tom Armitage, and Tom Taylor. Thanks to the Popular Science team, Mike Haney and Sam Syed in particular, Mark Poulalion and his team from Bonnier, and of course Bonnier R&D and Sara Öhrvall, the grand assembler! It’s a pleasure and a privilege to work with each and every one of you. Popular Science’s announcement talks more about features and reading experience philosophy, and hosts the press release and screenshots pack. I’ve got something I want to share with you. 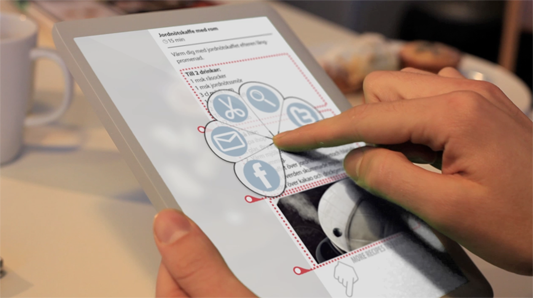 We’ve been working with our friends at Bonnier R&D exploring the future of digital magazines. Bonnier publish Popular Science and many other titles. Magazines have articles you can curl up with and lose yourself in, and luscious photography that draws the eye. And they’re so easy and enjoyable to read. 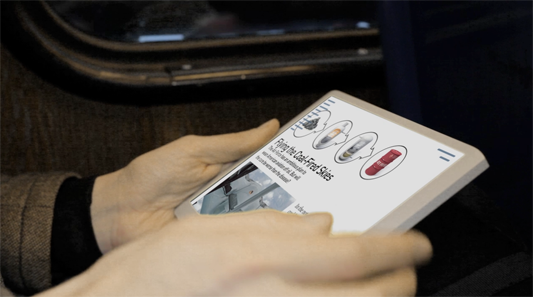 Can we marry what’s best about magazines with the always connected, portable tablet e-readers sure to arrive in 2010? This video prototype shows the take of the Mag+ project. You can see this same video bigger on Vimeo. The articles run in scrolls, not pages, and are placed side-to-side in kind of mountain range (as we call it internally). Magazines still arrive in issues: people like the sense of completion at the end of each. You flip through by shifting focus. Tap the pictures on the left of the screen to flip through the mag, tap text on the right to dive in. It is, we hope, like stepping into a space for quiet reading. It’s pleasant to have an uncluttered space. Let the Web be the Web. But you can heat up the words and pics to share, comment, and to dig into supplementary material. The design has an eye to how paper magazines can re-use their editorial work without having to drastically change their workflow or add new teams. Maybe if the form is clear enough then every mag, no matter how niche, can look gorgeous, be super easy to understand, and have a great reading experience. We hope so. That gets tested in the next stage, and rolled into everything learned from this, and feedback from the world at large! Join the discussion at the Bonnier R&D Beta Lab. 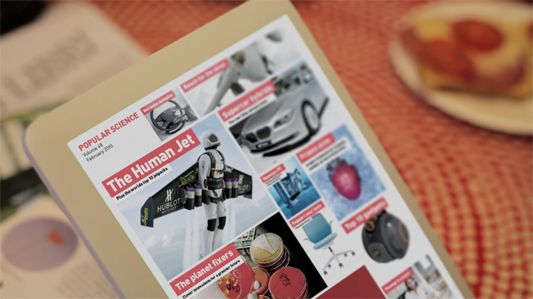 Recently there have been digital magazine prototypes by Sports Illustrated, and by Wired. It’s fascinating to see the best features of all of these. Many teams at Bonnier have been involved in Mag+. This is a synthesis of so much work, research, and ideas. But I want to say in particular it’s a pleasure to collaborate with our friends at R&D. And here at BERG let me call out some specific credits: Jack Schulze, Matt Jones, Campbell Orme and Timo Arnall. Thanks all!